Last month I had travel on my mind. Since we were only taking cabin baggage to Italy I was on the look out for products below 100ml. 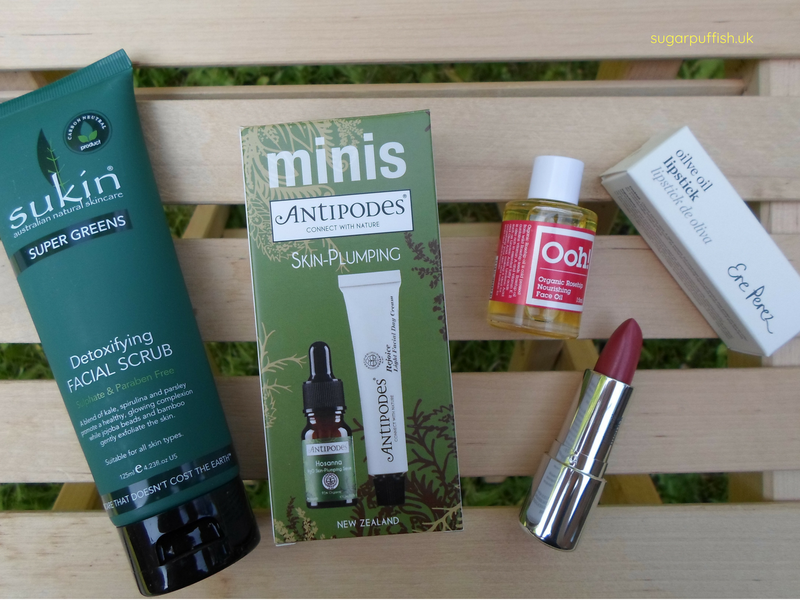 I chose the Antipodes Skin-Plumping Minis simply for the Rejoice Day Cream which is one of my favourite products. I first reviewed it back in 2012 so I hope that goes to show how genuine my love is for this moisturiser. I adore the sugary vanilla scent and how it feels on my skin. It's super hydrating without feeling heavy. In the Skin-Plumping Minis set you also receive Hosanna H20 Intensive Skin-Plumping Serum, unfortunately as it contains linalool I have to pass it on to someone else to use. Rosehip is one of my all time favourite ingredients so a travel sized Ooh! - Oils of Heaven Organic Rosehip Cell-Regenerating Face Oil was an easy choice. I had a last minute change of mind when packing and I actually ended up taking their Argan oil away with me but either way Ooh! is a good brand. I've used their oils many times before and would always recommend you check them out. 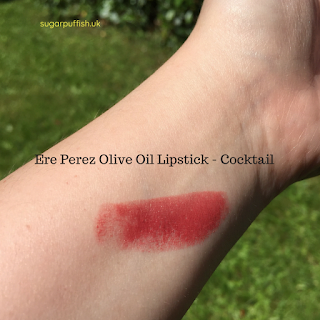 I'm totally rubbish at picking makeup colours online and Ere Perez Olive Oil Lipstick in Cocktail wasn't exactly as I envisage. It's described as "Earthy Rose" which makes sense now I see it in person. Cocktail is a colour you can swipe for tint or build for intensity. At first I was a little unsure but it's growing on me. I prefer a hint of colour so apply gently. The formulation is very easy to wear and non-drying, in fact I often forget I'm wearing it which is unusual for me. You know I love Ere Perez as I've reviewed numerous products from them and rarely do they disappoint me. My final product is Sukin Super Greens Detoxifying Facial Scrub. Lets just get it out there that I exfoliator once a month. The only variation on this might be on my summer holiday if my sun cream leaves me feeling greasy and overloaded. I'm a firm believer that most people over use exfoliators which contributes to skin issues and micro damage. That being said when I do buy a facial scrub it has to be very gentle, I can't stand anything which scratches or feels overly gritty. The Sukin Super Greens Detoxifying Facial Scrub ticks all the right boxes. The exfoliating particles are held in a lotion and it feels gentle and soft on my skin. Up until this point my exfoliator of choice has been Antipodes Reincarnation but Sukin has impressed me as a budget friendlier alternative. If you are interested in any of the products mentioned you can purchase them at Love Lula. I love Ere Perez products so much. Their lipsticks are amazing! I haven't tried the Antipodes Rejoice Day Cream, but I've heard a few people say how good it is. I might have to give it a try soon!